This is the 7th year that our office has offered free oral cancer screenings to the public during Oral Head and Neck Cancer Awareness Month. We are proud to be one of the few dental offices in Delaware to offer this service to those who want a second opinion, who may not have a regular dentist, or who are unsure that their own dentist is performing a thorough oral cancer examination. An oral cancer screening takes approximately five minutes and is totally painless. It is well worth this short amount of your time. If an oral cancer is caught early, there is an 80 to 90% survival rate. However, most oral cancers are not detected until they are in later stages, resulting in the death of 43% of the afflicted within five years. 1. A visual exam – the inside and outside of the lips, the cheeks, gums, hard palate (roof of mouth), soft palate (behind the hard palate), oropharynx (down the throat), top and underneath the tongue, back and sides of the tongue, and floor of the mouth. We are looking for areas that are red, white, blue, black, growths, or unusual in appearance. 2. Palpation (feeling with the fingers for abnormal texture, size, consistency, asymmetry) – the cheeks, lips, tongue, floor of the mouth, glands and lymph nodes of the neck, and thyroid. 3. Velscope exam – an additional visualization of the tissues. The filtered light autofluoresces the tissues thereby helping to identify areas of inflammation. Who gets oral cancer? Smokers. Alcohol imbibers. Young (the fastest growing segment) and old, especially if they are infected with HPV 16 (human papilloma virus – the same virus which causes cervical cancer). African Americans more than White Americans (twice as often). Men more than women (twice as often). Those receiving prolonged sun exposure. Possibly, those who eat minimal fruits and vegetables. Some progress is being made with recent oral cancer research. Studies indicate that the antioxidant effects of swishing green tea may help to prevent growth of oral cancer cells. PeriRx is developing a test of the saliva that detects early oral cancer disease risk when a suspicious lesion is discovered in the mouth. Treating current cancers by using photodynamic therapy and using proteins to stimulate the body’s defense mechanisms and bone marrow are in development. Our hope is that you are motivated to act. Let your friends and family know about our Free screening. Ask your own dentist to take extra time to do an oral cancer examination. Don’t wait until it’s too late. 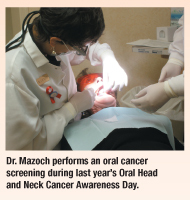 If you are not an existing patient of Dr. Mazoch’s and cannot attend the annual Free screening, but would like an oral cancer screening, then you can call to arrange a screening during regular business hours for a $48 fee. April is Oral Head and Neck Cancer Awareness Month. Heritage Professional Building, just off of Milltown road, near Kirkwood Hwy. Next Story → Phones & Hearing Aids: No More Static!